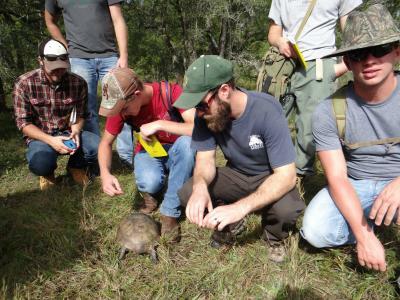 The Department of Natural Resource Ecology & Management (NREM) offers two majors: Animal Ecology and Forestry. Students also choose an “option” or area of specialty during their sophomore year. Students majoring in Animal Ecology will learn basic principles of animal biology, ecology and management. Animal Ecology courses cover interactions of animals with one another and with a wide variety of plant communities and aquatic ecosystems. Graduates find work as fisheries or wildlife technicians, environmental educators, conservation officers, fish farmers, zoo biologists, and in wildlife rehabilitation. Many choose to continue their education in graduate programs, including veterinary medicine. Students in our accredited Forestry program will attain knowledge and skills applicable to scientifically managing the nation’s ecosystems– private and public. Forestry courses cover the management of forest ecosystems for multiple benefits including wood and fiber products, biodiversity, recreation, interpretation, water, wilderness, and wildlife. Graduates find work as urban foresters, naturalists, restoration ecologists, natural resource conservationists, park rangers, fire ecologists, or in working with wood and bio-based products. Thinking of taking a few classes at a community college? Take a look at our Transfer Plans first to make sure they will fit your program of study.